Now here’s a first; two firsts in fact. This is the first time I have done a second Let’s Do Lunch article at premises still run by the same owner, and it is the first time I have eaten in a restaurant named after me – how flattering! My first visit was in January 2016, when the establishment had a dual identity, being called The Greedy Pig during the day (All right, I have reviewed a place named after me before) and changing to The Swine That Dines in the evenings. The owner has now decided to use the latter moniker on a permanent basis as it has built up quite a following. No surprise there, as the food was absolutely wonderful. The lunch menu, served from noon – 3.00pm on Wednesday to Saturday, is adventurous but not in a show-off, look-how-clever-I-am kind of way; just a list of imaginative dishes served straight and honest but with a twist. I had quite a struggle working out what I would order but I narrowed it down to two choices and, as they are small plates which I was told would be just right for lunch, I asked for them both. The first to arrive was Mussels, Sesame and Mint Harissa. 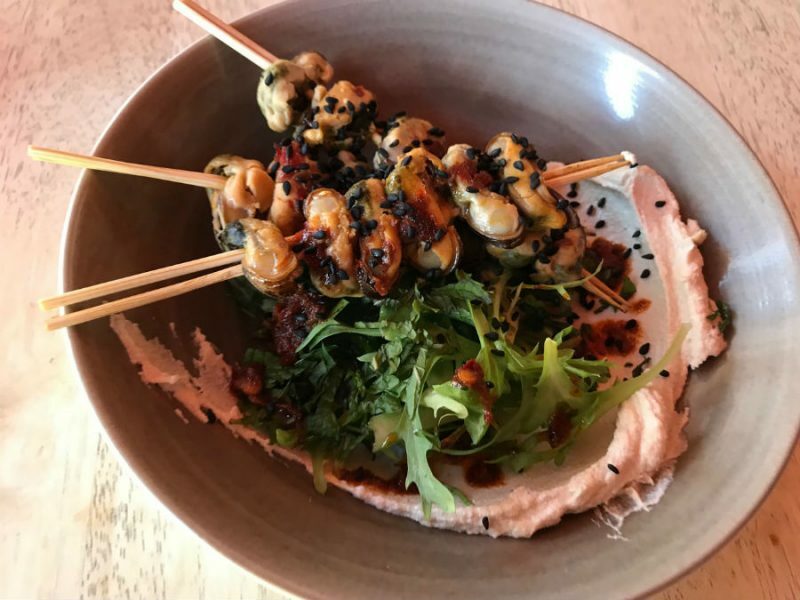 The molluscs arrived on three generously loaded skewers, having been cooked on an open grill, and had a wonderful barbecue flavour which did not overpower the delicacy of the seafood. I have written before about twice cooked mussels and how difficult it is to do this without their turning into rubber, but here they were done to perfection. They had obviously lost some of the moisture during the grilling process but still had enough to make them a pleasure to eat. The harissa added a hint of heat but again was not overpowering. The dish was beautifully presented and well worth the £6. 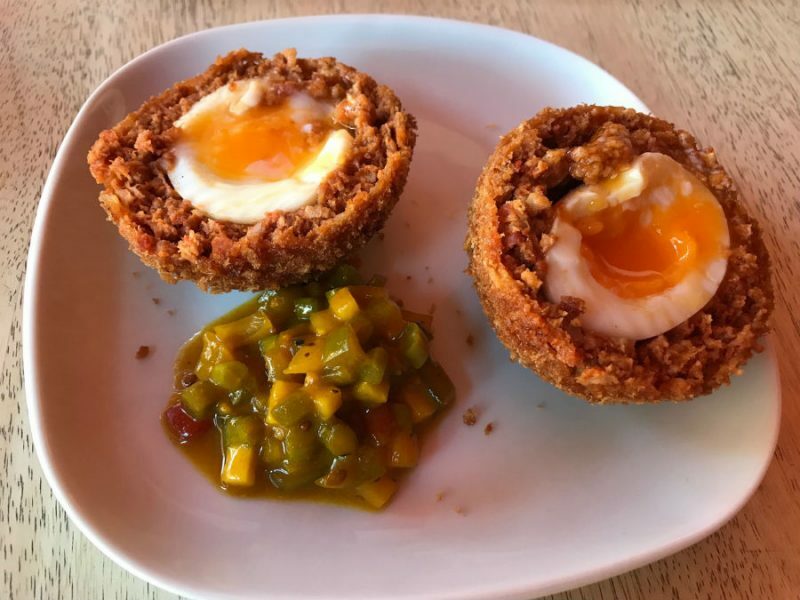 My second choice was seemingly old school, being GPK Scotch Egg with Piccalilli, again £6. If this sounds a bit steep for a picnic staple it wasn’t because it wasn’t. It wasn’t steep because it wasn’t the picnic staple we all know and love. The egg was perfectly cooked, being soft boiled, and the meat wrapping was enhanced with chorizo. Once again an ingredient had been twice cooked and served spot on, not as easy as it sounds. A perfectly soft boiled egg is difficult enough, so to then drop it in iced water to stop the cooking process, wrap it in the meat casing and deep fry it so that the sausage meat is cooked through but the egg keeps its soft boiled property with runny, hot yolk, is no mean task. The home made piccalilli was beautifully sweet and piquant, finishing the plate off a treat. Although I had probably eaten enough I had to have a dessert, which again was a familiar item on a menu: Custard Tart, £5. This arrived as expected, with no twists or turns but with baking this good, who wants twists and turns. If you do then there is Leeds Blue Ice Cream with Poached Pear and Black Pepper, yes, cheese ice cream! The Swine That Dines is a short walk down North Street but is well worth the effort. It is not licensed so I had a SanPellegrino Blood Orange drink at £1.50. You can take your own booze and there are three excellent watering holes within a few yards of the restaurant, so there are opportunities to have a drink if fancy takes you. I cannot recommend this place highly enough as, not only is the food good, the philosophy is faultless as well. Fresh ingredients, skill, love and soul.